Obviously this is just my take on things, from a week in North Yorkshire. If you have anything else you’d like to add please comment below or message me on Instagram. Roseberry Topping is an distinctive looking hill (many compare it to the Matterhorn in Switzerland) near Newton-under-Roseberry and Great Ayton. But don’t worry, unlike the Matterhorn it’s only 320 meters high and can be climbed in under an hour. It’s steep and tough going in places but easy enough for anyone of average ability, including dogs! There are a couple of paths you can take and all are well marked. There is parking at the foot of the hill in Newton-under-Roseberry and free toilets. There was a load of free on road parking when we visited but I suspect this might not be available now we are in the school Summer holidays! Goathland is perhaps better known as Aidensfield, home of Heartbeat. I used to love Heartbeat, turns out pretty much everyone else I’ve mentioned it to did not and finds the fact I liked it hilarious! Anyway, Goathland is nowadays a busy hub of tourism with Heartbeat memorabilia everywhere but long before it hit our screens people came to visit Mallyan Spout, the tallest waterfall in the North York Moors. It’s a fairly easy walk down the river and a slightly more difficult ‘climb’ to the waterfall itself over boulders and rocks, but as long as you’ve good sensible shoes on you will be fine. It’s such a treat when you get there, one family was even having a picnic by it with cans of FOSTERS! If you’ve read my previous blog post about our trip to the Lake District over Easter you will know that we gave wild swimming a go and we were keen to do so again in the Moors. Online we found information on Thomason Foss, a difficult to find waterfall in the village of Beck Hole. We parked just up the hill past the pub and basically scrambled down the side of the hill, then following the river to the waterfall. This is not an easy walk (and I fell down a flipping rabbit hole!) but there is a path which we couldn’t see on the way down. If you look on street view there is a tree with a green sign on it, that is where the path is – I wouldn’t recommend just going down the side as you might end up like me! Ooooh it was cold! Kudos to Mike as he got in and had a proper swim while I paddled in the shallow bit and complained about the temperature. It is really remote here and we had the waterfall to ourselves, the perfect place for a picnic (if you can carry it!) Don’t be too alarmed if you hear a loud rumbling it’s just the train.. though I must admit I was a bit worried some rocks would go a tumbling! So I know this sounds like another waterfall, but it’s not, well it’s sort of not. Falling Foss tea garden is nestled in enchanting woodland, just 6 miles from Whitby. I found this place as it was so highly regarded on TripAdvisor but I wasn’t expecting what I found. You order at a little wooden shack in the middle of the garden, dotted around are picnic benches and there is even a little play area for children. Choose a seat near the waterfall for a truly fairytale experience. We had tuna mayo sandwiches, and gluten free bread was available – WHOOP – it was the best gluten-free bread I’ve had to date too – tasted just like ‘normal’ ciabatta. They also have a wide array of Fentiman’s so I tried the rose lemonade that’s been doing the rounds for years and it was delicious. I had stupidly assumed it was just a pretty drink but it’s actually really tasty! They do host weddings and parties here so you may want to check they are open just in case. Oh and make sure you visit the loo, I won’t ruin it but it’s definitely a loo with a view! 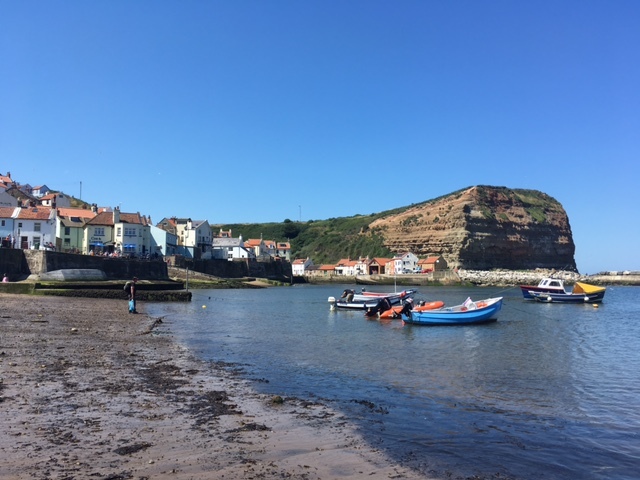 Don’t get me wrong, Whitby is a lovely little town and Robin Hood’s Bay is nice too but my favourite was Staithes. 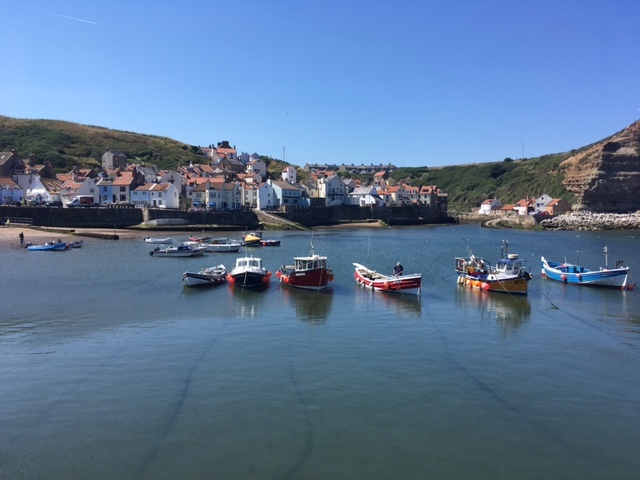 Wander down the steep street from the main car park (and stare open mouthed at the delivery drivers who seem to be navigating it with ease) and you will arrive at the pretty little beach. Unspoilt and majestic the beach is sheltered by imposing cliffs. You will find little at the bottom of the hill, some shops, pubs and an ice cream seller or two. There are lots of beaches to rest your legs and stare out onto the horizon – it’s somewhere to clear your mind. We visited a lot of places on our trip so I will just put some photos below, incase any take your fancy – just hover over a pic to see the location. Sutton Bank – ‘England’s finest view’ … even in the rain! Next PostNext Trains to Europe, is it for you?